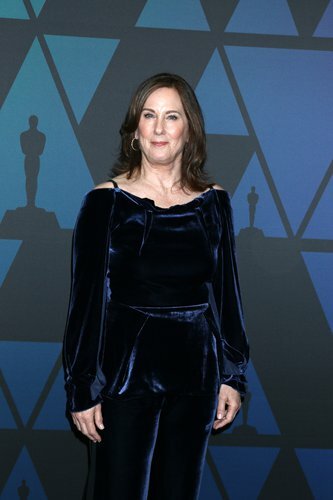 Star Wars producer Kathleen Kennedy on Sunday accepted a lifetime achievement award from the organizers of the Oscars and said she hoped it would open the door for new voices in the movie industry who "might bring the world back to its senses." Honored with her producer husband Frank Marshall, Kennedy was the first woman to receive the Academy of Motion Picture Arts and Sciences' annual Irving. G. Thalberg award. In 2012, Kennedy became president of LucasFilm, reviving the sci-fi saga and producing multi-billion dollar movies Star Wars: The Force Awakens and Star Wars: The Last Jedi that have made her one of the most powerful executives in Hollywood. "I am very proud to be the first woman to accept this award. But I am also not the first to deserve it and I am 100 percent sure I am not the last," Kennedy said to wild applause at a gala dinner attended by studio executives and many of Hollywood's biggest actors and directors. Kennedy and Marshall co-founded Amblin Entertainment with director Steven Spielberg in 1981 and produced of blockbusters including Raiders of the Lost Ark, Jurassic Park and E.T. : The Extra Terrestrial. Kennedy said recent efforts to improve diversity in Hollywood and give women better roles in front of and behind the camera must be embraced. "It is my hope that with the inclusion of these powerful new voices, we might just bring the world back to its senses and maybe, just maybe, shatter a few glass ceilings along the way," Kennedy said. Veteran actress Cicely Tyson, who turns 94 in December, was presented with an honorary Oscar for lifetime achievement, along with Argentinian musician Lalo Schifrin, the composer of scores for Dirty Harry and Mission: Impossible, and publicist Marvin Levy, who has worked with Spielberg for more than 40 years. New York-born Tyson, who has appeared in numerous films, television shows and stage plays, was praised by record producer Quincy Jones for her "grace, dignity and class" and for focusing on roles that highlight the struggles of African-Americans. Filmmaker Tyler Perry noted that Tyson began her career in 1950 "when black people weren't allowed to come in through front doors." She became known for playing strong black women in TV series such as Roots in the 1970s, the 1972 movie Sounder and more recently The Help. "She is a queen to us," Perry said.